"Ronald Knox's translation of the Bible has for too long been a forgotten masterpiece of twentieth-century English Catholicism. It is a last flourishing of that hundred years, the Second Spring, that produced so many great Catholic writers: Newman, Chesterton, Greene, Waugh and many others." Ronald Knox's translation of the Bible has for too long been a forgotten masterpiece of twentieth-century English Catholicism. It is a last flourishing of that hundred years, the Second Spring, that produced so many great Catholic writers: Newman, Chesterton, Greene, Waugh and many others. The literary reputation of these men has grown with the years, whilst that of Knox has unfairly declined (though his bibliography includes satires, detective stories, novels, sermons and devotional works). With the republication of his Bible perhaps the time has come to acknowledge that Knox undertook a work of scholarship greater perhaps than any other single Catholic since the Reformation, and did a service to the faithful equal to any done by a Catholic writer. For unlike in our own day when translations of the Bible abound to suit every taste and style, in Knox's time Catholics used the Douay-Rheims version, as Anglicans used the Authorised Version. Despite the enduring importance of the Douay version (even to our own day it remains the version most faithful to the Latin Vulgate), there was a long recognised need for a new translation. Newman had been the first to be commissioned with the task in the 1850s, but the project ran into difficulties. What a masterpiece that would have been. But Knox was at least Newman's equal as a classical scholar; in fact his academic honours from Eton and Oxford are astonishing. His precocious intellect – reading Virgil at the age of six – and, famously, when asked as a toddler what he thought about in bed, declaring 'I think about the past'. As a teacher I can say that such cleverness is not always an endearing trait! The task of producing a modern translation from the Latin Vulgate but with reference to the Greek texts (of both New and Old Testaments) and the Hebrew (for the Old Testament) therefore fell to Knox, who was commissioned by the English bishops in 1936. Having worked on this project for nine years throughout the Second World War, the New Testament was published in 1945 and the Old Testament, though completed and approved by the Diocese of Westminster by 1948, was not published until 1955, having been thoroughly checked by experts. During this time Knox was also busy with other books. His talks to evacuated school children produced some delightful popular works, including The Mass in Slow Motion, The Gospel in Slow Motion and The Creed in Slow Motion. Knox was a scholar who could speak to audiences of all ages and levels of understanding. As a Greek expert it is natural that the greatest achievement of this Bible is said to be his translation of the Pauline Epistles, but the entire work is marked by a fine, elevated and restrained English prose style. It is encouraging that the preface to this new edition has been written by Scott Hahn, the American biblical scholar who has done more than anyone in our own time to synthesise the scriptures with the doctrinal teachings of the Catholic Church. Hahn's works, like Knox's, should be better known to Catholics in this country. Knox was aiming for a 'timeless' English in his translation; to be elegant without being archaic, to be accurate but also natural. In this way it bridges the gap between the classic phraseology of the King James and Douay-Rheims versions and those modern editions which are idiomatic and unpoetic in their rendering of the word of God (the Street Bible begins Genesis with 'God starts it all off and WHAP! Stuff everywhere!' but thankfully this is not the version used in the lectionary). Mgr Knox begins 'God, at the beginning of time, created heaven and earth. Earth was still an empty waste, and darkness hung over the deep; but already, over its waters, stirred the breath of God.' It is an opening perhaps intentionally evocative of the devastation wrought by war. Knox lived through both wars; the first as an Anglican priest and the second as a Catholic, having been received into the Church in 1917 at Farnborough Abbey. Baronius Press is a London-based publisher which has now amassed an impressive catalogue of Catholic classics. Baronius does not simply reprint old books, but entirely re-typesets the text, digitally enhancing the images before producing editions of excellent quality, made to last. This book has fine leather binding and gilt edges, and the font is a good size. This is a not a compact edition but neither is it too bulky. It would make a wonderful gift. I think Knox achieved what he set as his goal in the Epistles; he comments on the length of St. Paul's sentences and he manages that length well, bringing clarity to some difficult passage of the Epistles. This is a beautiful edition of The Holy Bible and one I look forward to using in my devotions for the Year of Faith! Ronald Knox's achievement depends in no small degree on his astonishing translation of the Vulgate, which some – including Evelyn Waugh – have considered one of the landmarks of twentieth century English literature. It is certainly a great translation, in some of its strengths unique. I wouldn't be without it. "It's THE most beautiful translation of the Bible in the English language." Fulton Sheen used the Knox version when quoting. The Knox translation is not everyone's cup of tea if they are into philology. It will be your cuppa, however, if you are longing for poetry in your reading of the Word. A beautifully bound volume, I find myself responding with fresh eyes to the layout, which is formatted like prose, and the minimal distraction of footnotes. This is not a study bible; it's a reading bible, and Knox's language pulls us into the scriptural stories and images we know so very well and then elevates us with its staggering beauty. Yes, I read it and I wept. Not in fear, not in despair, but in consolation at the reminder, rendered so beautifully by Knox, that the world has resided in the madness of sin and shadow since Eden, but we are never abandoned, and need never be afraid. 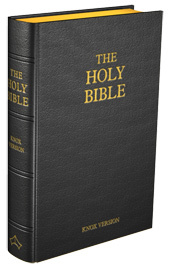 This is a bible meant for hunkering-down-to-read and becoming lost within–a true escape into another place, from where you emerge refreshed and elevated from simple joy of reacquainting oneself with language structure that is slightly higher and more formal than the usual, but more readable and (perhaps) accessible than the Douay Rheims. Others will tell you about the virtues of the text and its translator; I’ll just say that this edition is physically beautiful. The cover, the pages, the type … all make for an impressive whole. It will undoubtedly become many people’s “go to” gift book. First Communions, Confirmations, Marriages, Ordinations, Christmas, Easter … as Catholics we have so many wonderful occasions for giving beautiful things to those we love! And it’s my fervent wish that every priest should have one, especially in this Year of Faith. I think Knox achieved what he set as his goal in the Epistles; he comments on the length of St. Paul's sentences and he manages that length well, bringing clarity to some difficult passage of the Epistles. This is beautiful edition of The Holy Bible and one I look forward to using in my devotions for the Year of Faith! A beautifully bound volume, I find myself responding with fresh eyes to the layout, which is formatted like prose, and the minimal distraction of footnotes. This is not a study bible; it’s a reading bible, and Knox’s language pulls us into the scriptural stories and images we know so very well and then elevates us with its staggering beauty. Knox’s rendition is an unusual combination of dynamic-equivalence translation and high literary quality. Many Bible readers prefer word-for-word (formal equivalence) translation to paraphrasing (dynamic equivalence) translation for theological reasons: They believe a literal translation brings them closer to ipsissima verba Dei. But there is often another, non-theological reason for their preference: Most dynamic-equivalence translations come across as banal in their phrasing. (The notable exceptions have been the New English Bible and its progeny, the Revised English Bible, which have been criticized for using an excessively high register, making the Bible sound like the conversation at a toffs’ garden party.) Knox’s version is free, but of high literary quality, and repays the attention even of people who prefer a more literal approach. The Knox Bible is a good choice for both reading and study; those of you following the Lectio Divina—the practice of praying through the Bible, as we've discussed recently here on the blog—will find this an excellent companion. The Knox Bible's arrival in the Bible Gateway library coincides with a new print edition from Baronius Press—the first time the full Knox Bible has been available for over 50 years! In case you were wondering how good this translation is, Fulton Sheen quoted from it exclusively in his book The Life of Christ. This translation is often recommended for private devotional reading or Lectio Divina because of its poetic style. I was pleased to see in many places that the angelic world was not translated out: such as in Psalms 103:4 "Thou wilt have thy angels be like the winds, the servants that wait on thee like a flame of fire," the "angel" who "visits…with no kindly message" in Proverbs 17:11, and even "Lucifer" in Isaias 14:12. Of course, fans of the Douay-Rheims will be pleased to see, "Hail, thou who art full of grace," "Holy Ghost," "charity" (often rendered "love" in modern versions), and the traditional spellings of the proper names. I have just begun to read but already have seen a couple of instances where the translation brought tears to my eyes when I read it aloud … it struck a chord within. The Knox Bible was written to soak in, to spend hours lost in the text of the Bible. With most translations this is not the first thing that the reader would think of doing, but with the Knox translation it naturally occurs. All in all this is a great translation and is highly recommended. In the opinion of the reviewer the Knox Bible should be in every personal library. I can not recommend the Knox Bible enough. I am extremely happy that this translation is on my shelf, and will benefit from it for the rest of my life.